Several tasks (e.g. Create TOC) are left to the discretion of the author. Prepare Draft stage with Write text and Integrate Graphics task are mandatory. This stage has defined repetition rule what is symbolized by repetition decorator (i.e. hash). While research topic is a mandatory task, the task organize references is to be decided in runtime. It’s similar to create TOC and generate list of figures. Process will be finished when document is created or the deadline is reached. The name of the Case can be enclosed into the upper left rectangle. The various elements of a case Plan Model are depicted within the boundary of the case Plan Model shape. 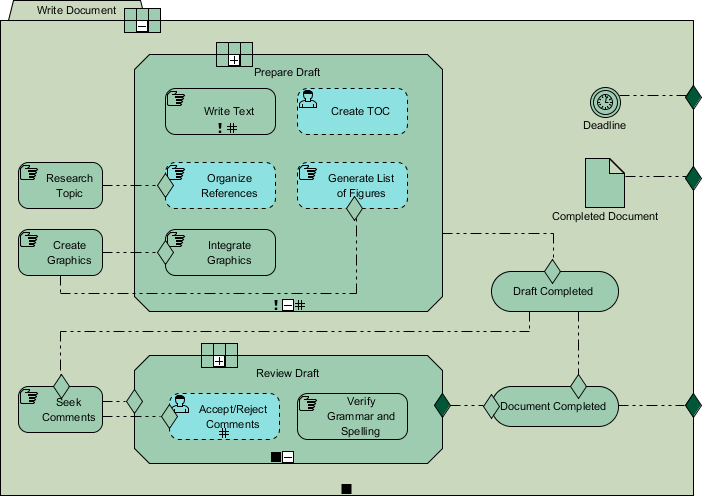 The diagram shows an example of a case Plan Model.